Description: Cananga is a tall tropical tree up to 20m high with large, tender, fragrant flowers, which can be pink, mauve or yellow. The yellow flowers are considered best for the extraction of essential oil. Aromatic Scent: Cananga has a sweet, exotic, deeply floral and heady with a creamy note. Common Uses: The chemical constituents of Canaga Essential Oil were sought for their efficacy in many applications, for their aphrodisiac, anti-depressant, anti-infectious, anti-seborrhoea, antiseptic, sedative and tonic properties. 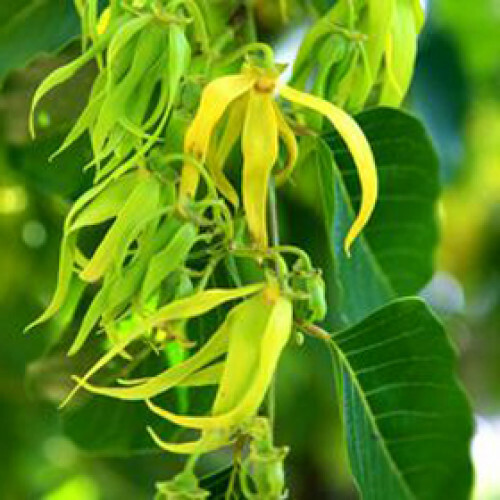 History: The Cananga, also called Perfume Tree and Ylang-ylang (flower of flowers), is a common tree in Indonesia. Its fragrant flowers are worn for personal adornment, and long used for its sensual and aphrodisiac properties, the fresh flowers are strewn on the beds of newly married couples. It was introduced to the island of Reunion in the western Indian Ocean in the late 18th century, and from there to Nossi-Be and the Comoro Islands about a century ago. Our Cananga Essential Oil is the fourth distillation of the oil from the flowers. Cautions: Non-toxic but possibly sensitizing. Use well diluted. Avoid during pregnancy. The chemical constituents of Canaga Essential Oil were sought for their efficacy in many applications, for their aphrodisiac, anti-depressant, anti-infectious, anti-seborrhoea, antiseptic, sedative and tonic properties. The Cananga, also called Perfume Tree and Ylang-ylang (flower of flowers), is a common tree in Indonesia. Its fragrant flowers are worn for personal adornment, and long used for its sensual and aphrodisiac properties, the fresh flowers are strewn on the beds of newly married couples. It was introduced to the island of Reunion in the western Indian Ocean in the late 18th century, and from there to Nossi-Be and the Comoro Islands about a century ago. Our Cananga Essential Oil is the fourth distillation of the oil from the flowers.